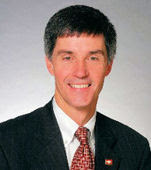 In Little Rock Saturday, the Republican Party of Arkansas re-electing Chairman Gilbert Baker to a second two-year term. No one challenged Baker, a Conway state senator, despite the party’s election setbacks. Baker said the Democrats "beat us with the core principles of personal responsibility, smaller government & cutting taxes. They took the pages out of our playbook and tried to insert them temporarily into theirs. That makes it very difficult for them as they move forward, but it should give us comfort and ... remind us that we have to stay committed to those principles that we know are basic bedrock conservative principles." Baker said he will appoint a steering committee of business leaders in the next few weeks to review the party’s strengths and weaknesses and make recommendations to improve the party. He wants to re-engage the business leadership in this state and wants engage social conservative that are involved in the party.